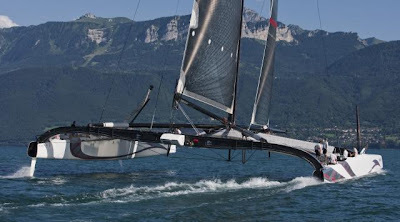 The Swiss America’s Cup Defender, Alinghi, hoisted the sails on its giant new catamaran Alinghi 5 for the first time today on Lake Geneva, Switzerland. 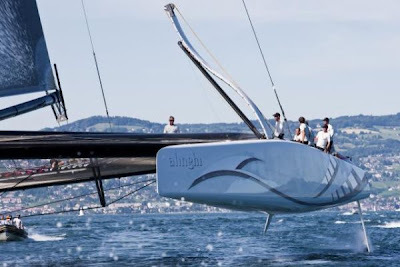 The 90ft multihull was cheered off the dock at midday by hundreds of spectators watching the maiden sail out of Le Bouveret. 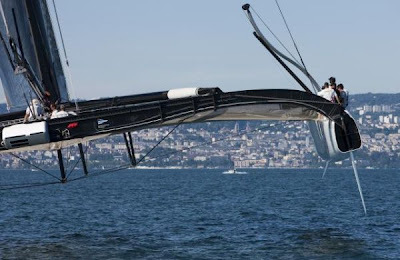 Murray Jones, who is running the initial trials of the giant multihull that represents a first step in the development process towards the 33rd America’s Cup, gave his comments on a good first day on the water: “We went out this morning with a list of objectives to work through: testing the boat, checking the structure, doing some manoeuvres and seeing if the sails would all sheet and it went pretty well; we ticked off just about everything. There are a lot of systems on the boat that are complicated and new, but it was fantastic. 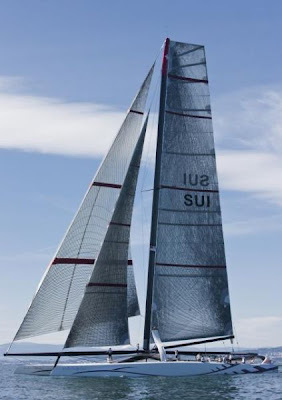 This multihull – the culmination of 100,000 man-hours – was launched on 9 July by helicopter and will continue to sail on the Lake over the coming weeks.